Often I am faced with patients who need to start from scratch with their skincare routine. It may be that they have been fans of “soap and water and cold cream” which they were able to get away with in their twenties and thirties, but is in their forties, fifties, sixties, not so much. Or it may be that they have shelves of half-used potions and need to give it a rethink. (Let’s face it, many of us buy products based on extravagant promises and end up with multiple bottles of goop and a dim memory of what we hoped they would achieve). So, when looking at your skincare, my first go-to consideration is always Vitamin A.
Vitamin A is one of the most potent and exciting ingredients in skincare today. Used topically as retinoids, vitamin A derivatives range from prescription only retinoic acid (tretinoin), to non-prescription medical-grade retinaldehyde and non-medical grade retinol. The generic term for the family of ingredients related to Vitamin A, which occur naturally in our bodies. When referring to topically applied Retinoids, the only retinoid that your skin is able to process immediately is retinoic acid. All other forms of retinoids have to be converted by skin enzymes into retinoic acid before the skin is able to use it. The only form of retinoid that cell receptors can recognise is retinoic acid – the other forms need conversion. So, over the counter retinoid is also effective at renewing skin pigmentation and texture, it takes longer. This is because retinol is gradually converted into retinoic acid (the active ingredient in the prescription creams) so it is less potent and gentler. Medical grade, this is available by prescription only, and you need to develop a tolerance (it can burn, itch, scale, peel). Retinoic acid is powerful at the level of 0.05% (brands include Retin-A). Retinoic acid can be used by your skin without having to be broken down by your skin’s enzymes. This makes it about 100 times more potent than the average over-the counter creams containing Retinol. It is used mainly as a prescription drug for severe acne, although some dermatologists prescribe it for patients in a hurry to renew aging skin and who are willing to tolerate the side effects. Also powerful and effective is Retinaldehyde – it has the advantage of having no burn, being less irritating, and also being available without prescription. Win-win. Retinol is a specific form of vitamin A that is naturally produced in your body. It is used in over the counter products, often ‘encapsulated’ where the particles are stabilised in the bottle, but are released once placed on the skin. Enzymes in your skin convert retinol into retinaldehyde and then into retinoic acid when applied to the skin. This two-part conversion that it has to undergo before the skin can use it makes retinol a naturally gentler substance than retinoic acid. While results are slower, it has fewer side effects like burning or flaking and is more easily tolerated. The conversion into retinoic acid can take at least a few weeks, which is why you should use retinol products consistently for a few months before expecting to see results. When you start using a retinoid product you may experience “retinization” or a purging effect because of the acceleration of cellular turnover. The rate and duration at which you experience this depends on the type of vitamin A product you are using. Retinization often appears as whiteheads / little bumps in the areas of your face where you normally break out as well as redness, flaking and dryness. It does not cause inflamed cystic acne; if you experience this something else is going on. Retinization/purging can last anywhere from a couple weeks to a couple months. Of course, this will vary from person to person and also depends on the variety of vitamin A used. Start with or stick to a gentler retinoid such as retinaldehyde or an encapsulated retinol. Start with a lower concentration and work up gradually. Use a small amount. Typically a pea-sized amount is all you need so don’t overdo it. Wait 30 minutes after washing your face before applying your retinoid product. Buffer it with oil or moisturizer. 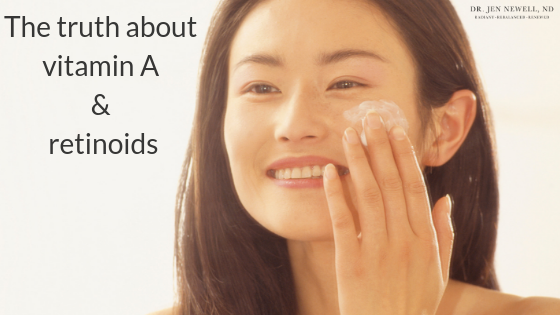 You can do this by applying a thin layer of oil/moisturizer before you apply the retinoid. Similarly, you can actually mix the two together in your hand before applying. Don’t apply your retinoid every night. Every-other night, bi-weekly, or even once-weekly application can be and have been done. You can also start out with 1-2 times per week application, then increase frequency gradually. Moisturize your skin well both morning and evening. Repply moisturizer if needed through the day. Don’t wash your face more than twice a day, and use a very gentle cleanser. If you wash your face too much or use something that is too drying, you could add to the irritation and make things worse. Don’t manually exfoliate your face. If the flakes are driving you nuts, use a clean wet washcloth and very lightly/gently run it over your face – like one or two passes. Rinse, then dab your skin dry, and immediately apply your moisturizer or oil. Avoid exposing your face to hot water. Tepid (lukewarm) water is fine, but I’ve actually found that straight up cold water works best to calm my skin.